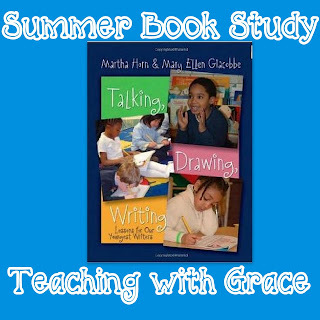 Chapter 2 of Talking, Drawing, and Writing by Martha Horn and Mary Ellen Giacobbe is all about how to start the children recording the stories that they've been telling for a couple of weeks! It starts out by describing the Drawing and Writing books for the kindergarten level (with a larger version for the teacher) and describes how to introduce the books as well as how to introduce the procedures. As teachers, we all know the importance of making the books very special and teaching the children to care for the materials. There are several pages of "script" getting you through the first two parts of the first lesson. The authors have noticed that using published books are valuable, but even more valuable to the children's learning are the teacher's modeled lessons as well as the work of other children. These examples give vision to young writers for their own work. The children are taught from the very beginning to start each writing session by rereading their previous work. They are taught to think about it from the point of view of their readers. Specifically, they are told to ask themselves, "What else do I need to put in so that my reader will understand my story?" and "What do I need to change so that my reader will understand my story?" 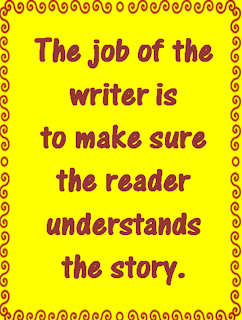 When we were trained in Writer's Workshop by Mary Ellen Giacobbe, I remember specifically, her remind us, as well as the children, that the job of a writer was to make sure the reader could understand the story. Looking at the story from the point of view of the reader is something I still work at today, as a blogger! As a second grade teacher, the children are more advanced in their skills, but the principles remain the same. We start the year making sure it is clear exactly what is expected. We make it clear how to use and put away the materials, what to do when starting writing for the day, and what to do when writing time is over. We teach them what is expected during conferencing and sharing, and we teach them the ultimate job of the writer: to make sure the reader understands the story. Feel free to download and print my poster for your classroom by clicking the image above. It's not too late to join in the book study! Click the book image for a direct link to Amazon! If you're a blogger, write your thoughts on this chapter and link up with Jennifer at Teaching With Grace! This is a great post. I LOVE how you have information about yourself and your site embedded in your google download. I need to do that too! I'm glad I visited your site and clicked your download! I love your poster! What a great saying :) Thanks for sharing! I love your poster! It's the perfect reminder for students of all ages! I will definitely be working harder with my students this year to reread their work first! Thank you for linking up! Writing is my hobby and most of the time I am try to writing some books and now I've a change to make believable my writing dream. Your new writer and see this that helps me a lot to makes success my writing career.